Figure 1. Structuring tools for international partnerships. A UMI is a full-fledged laboratory, as found in universities and research organizations. It is based in a single location, in France or abroad, and brings together researchers, students, postdocs, and support staff from CNRS and the partner institution(s). The Director of the UMI is jointly named by CNRS and the foreign partner institution(s). A UMI last 5 years and is renewable twice after evaluation of the UMI activity. IPAL is a Franco-Singaporean joint research laboratory created in 1999, in the field of indexing and image search by content, and the analysis of signal processing. 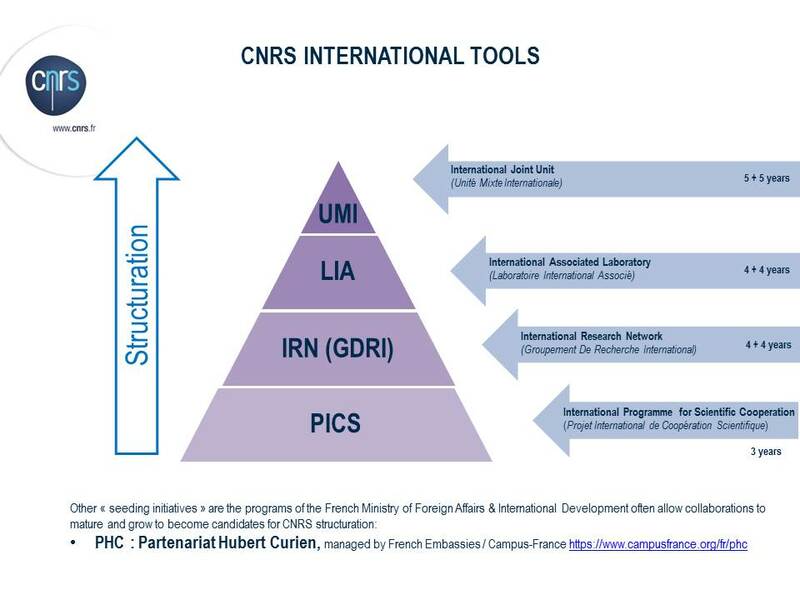 It became an International Joint Unit of the CNRS in 2007. IPAL now targets wider areas of computer vision, multimedia and digital health, in particular assistance of persons for greater home autonomy. CINTRA was created in 2009 after a decade of collaboration between the various stakeholders. The three partners involved in this UMI complement one another with a research focus on nano components and new structures of associated circuits to go beyond current technological capacities. They develop new technologies to integrate electronics and photonics more finely, and take advantage of their combined properties to meet future technological challenges in communication, computational devices and sensors. Created in 2014 as a continuation of the CAFS Associated International Laboratory (Cell Adhesion France-Singapore), this UMI is set within Mechanobiology Institute of Singapore, a Research Center of Excellence funded by the National Research Foundation (NRF). Mechanobiology is the study of the influence of mechanical forces on the biological responses at the molecular level to the tissue level, for example cell contacts, “mecanosensing”, the establishment of cell polarity or the formation of cellular junctions. Previously known as the LIA FSQL (France-Singapore Quantum Physics and Information Laboratory), this UMI, created in 2014, develops researches on quantum physics, lasers, bidimensionnal matters, cold atoms and computing. This laboratory, based in France on the Centrale-Supélec campus, works on new concepts in electromagnetism and radars and tightly collaborates with DSO, a defense system Singaporean agency.